What Is Testing Time? Is It Legitimate? What is Testing Time about, is Testing Time legit and can you really make money on this platform? I’ve recently reviewed several usability related sites – such as one of the most popular, user-testing and user–zoom. Testing Time is another usability website, but this time it is based in the UK. That said, from what I could see signing up, you can join from most places worldwide, so check it out. Although you can sign up from all over the globe however, it doesn’t guarantee you’ll qualify for the tests. This is because, the creators of the tests will always be looking for a particular demographic. Sign Up For Free Here. >> Fed up of making pocket change online? Try This Instead. What Is Testing Time About & How Does It Work? Testing time is a legitimate website, where you can earn a small amount of money for testing websites online. 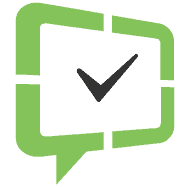 The tests involve visiting websites and completing certain tasks asked of you. 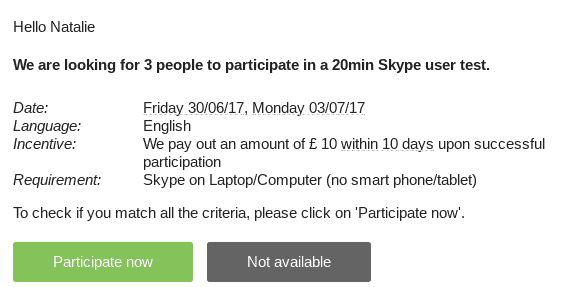 You’ll need to be signed up with Skype, have a good set of headphones, microphone and, ideally, a webcam too. So, some tests will require you to record your face, as well as your voice. Most Usability testing websites like this, will at least want a voice recording – so, if you’re shy about that, Usability testing is probably not for you. How much you can make with these sites, really depends on how many tests you can get approved for. Testing time say that they will most likely provide you with around 2-3 tests per week. For each test you complete, it could take between 30-90 minutes and you could earn up to around £50. In comparison to some other lower-income opportunities, (such as survey sites) the money is a significant leap in the right direction. Anyone can sign up to be a User Tester with testing time. They just look for regular people and you don’t need any special skills. The only thing you will require, is a basic computer knowledge. Tech wise, you’ll need to know how to use Skype as well. Signing up is simple and you can quickly fill out your details – simply enter your address, telephone number and SKYPE ID. If you’re not looking to do remote testing, you can leave your SKYPE ID out, but that would mean you’re only qualifying for tests face to face. They do have a referral opportunity – whereby, you can earn £5 for every member you recommend, who then goes on to complete a test. You can also follow them on Facebook, to keep up to date with anything new. Now is the waiting game, Testing Time will contact you via email when there are any tests available. When you’re invited to a test, you’ll be able to review the information about the test. Such as; what equipment is required, (e.g. Skype, laptop) how much it pays and how long the test should take to complete. If you choose to accept the test, you’ll be asked a series of questions, to ensure you meet the right criteria. I Was Sent A Test – Almost Immediately. I was sent a test about 5 minutes after signing up, which has never happened to me before with these websites. So, the test on offer was for £10 – not bad at all for 20 minutes! If you don’t want to complete the test, you can just click the “not available,” button. Once you’ve successfully completed a test, you’ll be paid within 5-10 days and that may be via PayPal, or direct debit if you prefer. You can then wait until you’re sent another test invite. Rather than just relying on one website, it’s much better to sign up with various sites offering Usability testing. That way, you’ll have a much better chance of making a reasonable amount of money from it. Usability websites are one of the best ways of making a bit extra on the side, especially if you’re organised about it and have joined several. You also need to be quick to reply to the tests though – these tests are sent out on a first come, first serve basis. Once the test is gone, it’s gone – Testing Time has over 80,000 members, so you can imagine how quickly tests will be snapped up. If you do regularly check your inbox and if you often have access to a computer, you’ll be in with a better chance. Do you have any experience with Testing Time? Leave me a comment below! Do You Want To Make Passive Income Online? One of the things that excited my about making money online, was the idea of passive income. The idea that you could create something once, or put the hard work in initially and then earn off the back of that work, time and time again. One way that you can build up passive income over time, is through having your own website. Once you build up a website, there are a variety of ways you can start to profit from it – whether by advertising, affiliate marketing, or selling your own products. While it certainly takes a lot of work to build up a blog or website, the work you put in from the beginning, can pay off for you later. Then it can continue to pay off, more many years to come, (as long as you maintain it of course). Also, you don’t need any special design or coding skills to create a website anymore, so it’s simple to get started with it. If you’d like to learn how to do that, there is some free training you can access here. Have you had much experience with Usability testing — what do you think?